So once I had checked out the exterior of Thomas Mangum's 3H tuned R33 GT-R and talked about the mechanical bits, it was time to go for a drive. First however I did a quick check of the interior. 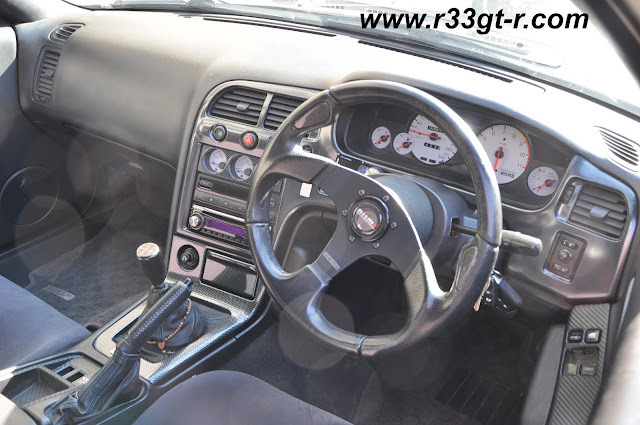 Thomas' car has some interesting bits, although as interiors tend to be even more expressive of individual taste than exteriors (because interiors aren't as visible), my thoughts here might be a bit more subjective than usual. Note red dotted door card. Momo steering wheel with the Nismo horn button. 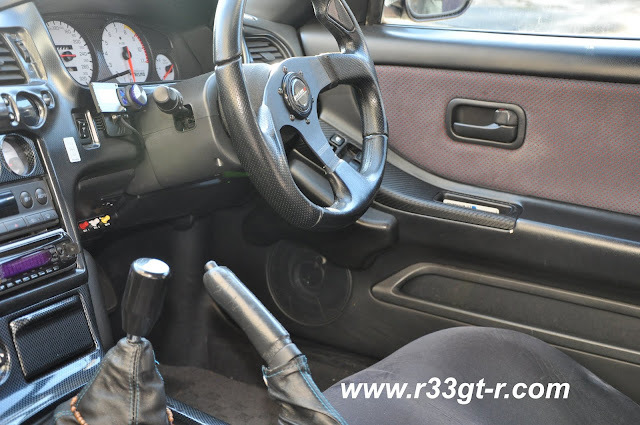 You can also see his Greddy OLED boost controller mounted to the left of the steering column. Those with sharp eyes will see the Bee-R rev limiter mounted below that. Obviously an immediately obvious difference from my car are the white faced NISMO gauge clusters. While I thought it would prove distracting, oddly enough it didn't bother me at all! In fact I can see how this might be better during the day, at least from a visibility perspective. No airbag is giveaway for Series 1... got some interesting carbon-like pieces there though. Looking closely, you can see 3 different carbon fiber patterns. 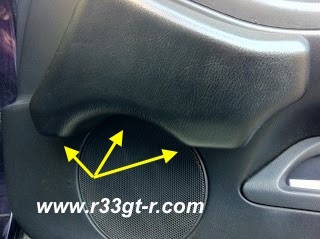 The main fascia is actually an extremely rare, OEM option, carbon fiber print-like fascia. The carbon pattern on the shift surround however is a clear print, and the driver's side door switch panel is carbon wrapped. Not for me, but an interesting collection! SO...putting aside the interior aesthetics and my subjective commentary on it, how does the car DRIVE? Ok well the first thing I noticed was the Series 3 transmission Thomas installed - in a word, superb. 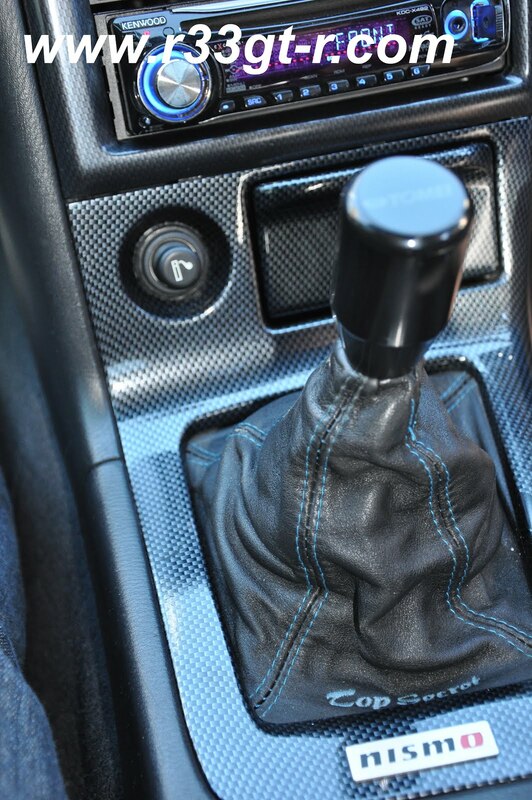 I was blown away by how the shifter is so direct and precise - of course not in the league of the NSX I drove a while back, but way better than the gearbox I had in my car (before GETRAG). In fact, even compared to the GETRAG now installed in my car, being totally honest with myself, I'd have to say I prefer how this feels - a no-slop, no-slack, extremely direct gearbox - not as heavy feeling as the GETRAG either. Thomas told me he has a short shift kit but it must be the NISMO Quick Shift (with a 25% shorter stroke), I previously had the NISMO Solid Shift (only 10% shorter stroke) but it did not feel like this! Second thing I noticed was how hard and stiff the suspension was as I drove around town. Usually this is something that one notices as a passenger, not as the driver. "Don't worry" Thomas said with a grin from the passenger seat, "You'll see how it all smooths out on the Wangan." The car is running Greddy S Spec Full tap dampers, with spring rates of 10 kg-m front and 8kg-m rear - this is a custom set up he selected, seeking the best balance between livability on surface streets and control while blasting on the Wangan. And he was right - when we later took the car on the expressway, the car not only felt stable, smooth and responsive, but the balance was superb. Speaking of balance, one area which I thought could be improved was the brakes. This car runs F50 Brembos up front on 355 millimeter BIOT 2 piece rotors (Endless brake pads), and the OEM rear Brembos using custom brackets on 350mm VQ36 Skyline rears rotors (Project mu pads). If you recall from when I installed the R35 brakes on my car, old thinking was the need to have bigger rotors up front with smaller in the back. More recently the thinking is that, having the rear rotor almost as large as the front can only help and in fact contribute to more stability. Nissan apparently realized this during the production run of the RB26 GT-Rs, which is why the last R34s had larger OEM rear rotors. In fact this set up is now a popular conversion in Japan, giving great stopping power at a very reasonable price, although you will need 18 inch wheels (which most people upgrade to anyway) as this combo is too large for the stock wheels. Stopping from speed wasn't a problem in this car, but not sure if it's the inherent front brake bias, or the different pads, or the lack of a digital G-sensor (its function affects the braking as I discovered), but I just felt there was too much emphasis on the fronts - not necessarily a bad thing but subjectively not what I am used to anymore. Finally, two areas where this car has a very different personality from my car - the handling and the engine power delivery. Driving around town, the handling didn't seem too different from most GT-Rs I've driven. And it wasn't that different when making lane changes on the expressway. It was when I was making a sweeping right turn at about 60kph, getting onto the expressway, when I noticed how the rear end of the car felt more planted and direct than mine. Hard to describe but it was almost an oversteer effect, meaning that the fronts could focus on getting the car through the curve as quickly and neutrally as possible. Thomas believes this is a result of having SuperPro bushings all around, I think it might be his rear camber at -2 degrees (according to Thomas) as well as how he has rear roll center adjusters installed. It also might be his disconnected Super HICAS, although I've driven other cars with locked out rears and suspect the camber angle as most likely the reason for this rear end agility. Anyway, this experience has inspired me to start thinking of upgrades to my car in the same way! Finally, the engine. Obviously I was curious about how the V Cam was going to affect things. Since I hadn't driven his car BEFORE he installed the V Cam, I can't give a direct comparison, but with the larger 2530kai turbos, I expected that the car would have suffered from turbo lag and then boom! When I asked Thomas, he did confirm that before he'd find himself having to shift down from say 5th to 3rd, to raise the RPMS, in order to get enough torque by engaging the turbos (which came on full at about 4500 rpm he says). Not only did this cause him to end up working with a very small rev range (before having to shift up) but the sudden increase in torque would cause his rear end to violently swing out on occasion. Driving it now, the V Cam is programmed to kick in smoothly and provide enough torque down low such that the transition from the V Cam to when the turbos kick in is seamless. In other words, the engine feels like a much larger engine with a gradually increasing torque from lower RPMs reaching a maximum torque value somewhere in the 5000rpm range. I've heard that with V Cam, it makes the smallish RB26 feel like a larger engine - and now I get it. At least on the bottom end, Thomas' car DID feel like it had a larger naturally aspirated engine. Of course once the turbos kick in it still has the GT-R flavor. Thank you very much Thomas for the opportunity - it's given me some inspiration for my car but also reassurance that my car is in good shape as well. Stay tuned as I have some minor tweaks coming up very soon! 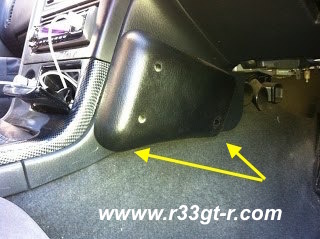 I'm loving the thoroughness you cover R33s in your blog. Most people gloss right over them, so your info is vital! The White Nismo is excellently visible and better than the dark one in two situations. During the night with lights on and during the day with the lights off. Once you turn the lights on with day driving, the cluster becomes totally useless, it get some kind of reflective effect and you can't see anything. I do have bright leds in it so that only amplifies the effect. Any how these white ones seem to be the most popular and fetch €1000+ on yahoo these days. Did those ultra-wide wheels affect the feel or steering that you could tell? Never gonna stop reading this blog! I have a LP2 S1 myself, not as modded like Thomas is. But buying stuff for it every month, never selling. The interior was for me fascinating (which shows how sad I am). I could almost hear you saying "the carbon does not match!" The bolsters were a cool feature that I had never seen before. Although do not feel too envious, as I am a big guy and need the space! White dials are always cool and although I have the blue GTR interior, I had the seat belts made to tie in with them which (for me) it brings everything together as the plastics are that grey blue. Nice report, will make mine available when your over! Well I would like to thank Aki for taking the time to critic DAS ride, I remember when I first met Aki my car was 98.9% stock, the only thing it had was a MINES VX ROM and a very heavy Steel APEXI Exhaust. Now the only thing left stock on the car are the interior and seats albeit I did acquire those from another car I used to own. I do however blame AKI for the bug, when my wife comments on the parts I acquire my default answer is its Aki's fault. I remember we used to have long conversations about the expectations of our rides, and what we had planned, Aki likes throwing the NISMO catalogue at his car! Although I have dumped more money into this car than is probably safe to tell my wife, its not even close to being done, I foresee a carbon drive shaft, I'm sitting on a complete GETRAG setup (debating on whether to install or not), big single has crossed my mind. I do miss the lumpy sound of a loping cam, but the VCam is a game changer in terms of performance, it's supposed to increase your gas mileage, but I haven't seen that happen in fact my gas mileage has gotten worse, with the twitch of my big toe I'm boosting, the Vcam has made this GTR a lot more fun to drive. 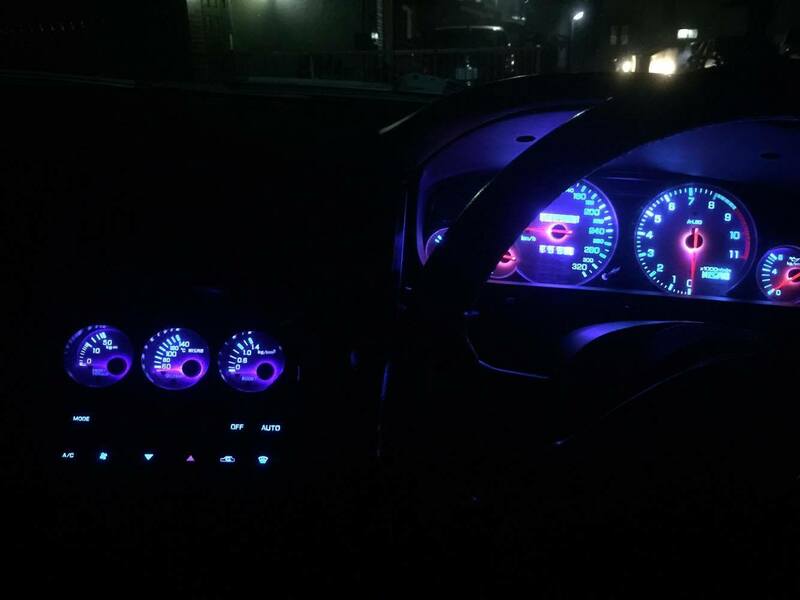 I have bnr32 with both dash and center nismo white gauges. Dash and gauges still have oem light bulbs inside. I'm looking for LED options for backlight, but original backlight is some kind of green color because OEM bulbs covered with green caps. Maybe you can advice some good leds?